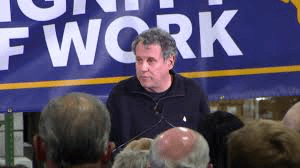 Ohio Democratic US Senator Sherrod Brown….Medicare for all not ‘practical’….. Props for having the balls to say so out loud and running for the Democratic Presidential nomination…. It would cost TRILLIONS to put in place …. Other Democrats and Bernie Sanders are peddling something that IS NEVER gonna happen…. Sen. Sherrod Brown (D-Ohio) took a shot at some of his fellow Democrats on Friday, saying that “Medicare for all” is not a practical idea. “I know most of the Democratic primary candidates are all talking about Medicare for all. I think instead we should do Medicare at 55,” Brown said. Brown, who may run for president himself, spoke during a roundtable discussion with the Clear Lake Chamber Of Commerce in Iowa. “If someone has lost her job at [age] 58 or his plant closes at 62, he should be able to buy into Medicare early. It will cost a little bit more, but to me that’s about helping people now … it’s something we might be able to get through Congress,” Brown said. Medicare for all has been gaining traction among many progressive Democratic candidates like Sen. Kamala Harris (Calif.), Cory Booker(N.J.) and Elizabeth Warren (Mass. ), and some on the left view support for such legislation as a litmus test. Brown is not historically opposed to Medicare for all as an aspiration, but he said he would rather focus on what’s practical. “I’m not going to come and make a lot of promises like President Trumpdid … I’m going to talk about what’s practical and what we can make happen. And if that makes me different from the other candidates so be it,” he said…..